Jazzy Vegetarian | Vegan Recipes - Making the World a Better Place, One Recipe at a Time | Blog : Eating Turkey-Less is More-Enjoyable! 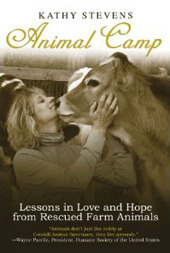 Today Kathy Stevens shared heartwarming tales about her work as Founder of Catskill Animal Sanctuary. She also discussed her favorite Thanksgiving food choice and talked about her new book, Animal Camp. Kathy shared the touching tale of Norma Jean, the turkey she rescued from a "Turkey Bowl" one thanksgiving year! I shared my delicious, nutritious recipe for "Savory Walnut Mushroom Stuffing" and suggested variations on how to serve it at your special holiday meal. I also shared Kim Basinger's favorite vegetarian thanksgiving treats and Kevin Nealon's preferred giving thanks foods. I talked about how you can adopt a turkey by donating to adoptaturkey.org! Music from Jim Brickman's lovely new CD, "Home," was highlighted with "Welcome Home" featuring the talented Robin Meade on vocals! Please join us! To hear the show, please visit: "No- Turkey Holiday Recipes!" I had a tofurkey roast for thanksgiving and been a vegan since 1970. I believe in uplifting other species, not enslaving them and then eating them. Thanks for your site and getting the message out. PS-I met you when you were in Bee Hive. I was the keyboardist for Cookie across the street at Kenny;s.